The real-life married couple established their personalities in radio with The Burns and Allen Show and brought their comedy to television in 1950. For nine years on CBS, every show opened with Burns, puffing his trademark cigar, regaling the audience with stories of their vaudeville days… and the latest antics of his beloved wife, Gracie. Often entangled with their neighbors the Morton’s, Gracie’s zany wit was always the cause (and solution) to their misadventures of domestic bliss. Burns would always end the show with ‘Say goodnight, Gracie’ to which Allen simply replied Goodnight. 64 Full-Length classic TV shows with the original network commercials. Starring George Burns and Gracie Allen. 16 DVD Set – Excellent Quality Film Transfers. This is a great collection. The quality is great. I was amazed that they even looked good on my 60 inch HD TV. Because they are 4X3 aspect ratio they were a little stretched, but still were easy to watch on the giant screen. Awesome, I highly recommend this collection. Gracie, Gracie, Gracie. Could you be any more lovable?! I doubt it’s possible. She’s a character that should be just plain annoying. But she emphatically is NOT. George Burns said over and over again that he had found pure gold when he found Gracie. You’ll see why. He is her perfect, very loving and funny straight man. But Gracie is the show. You will find yourself just smiling every time you see her. Nobody else could pull off this character like Gracie Allen. I’d never seen this TV show before, tho I had heard of it. I found the station “Ant TV” by accident and it plays the Burns and Allen Show late at night. I’m very glad to have discovered this true classic. This set of DVD’s starts at the beginning in 1950 and goes thru to about 1953. The episodes on television are from the last couple of years it aired and have a sightly different premise about them. (They’re real son, Ronnie, becomes part of this cast.) They are every bit as funny as the early shows seen on these DVDs. It’s nice that this set is completely different from what you can find on TV, At the end of these later shows George and Gracie come out and do some of their vaudeville bits and they are truly funny. In the earlier shows you see that they work them into the show and are just as funny. 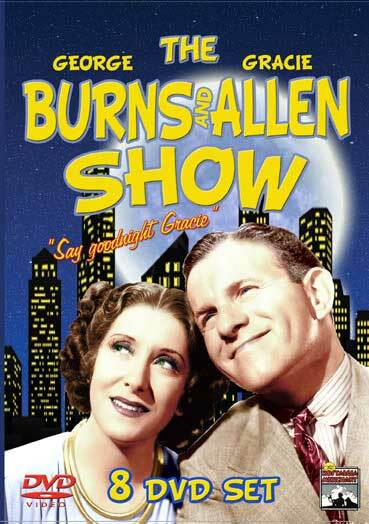 You can’t lose watching The George Burns and Gracie Allen Show. I defy anyone to watch these shows and not fall absolutely in love with Gracie. If you don’t, I’m pretty sure you’re not somebody I’d like to spend time with. “Say goodnight, Gracie”.